EURGBP pressure still remains higher as it looks to extend its recovery higher. On the downside, support stands at the 0.8600 level where a violation will turn focus to the 0.8550 level. A break below here will aim at the 0.8500 level. Conversely, resistance lies at the 0.8650 level. A violation if seen will turn risk towards the 0.8700 level. 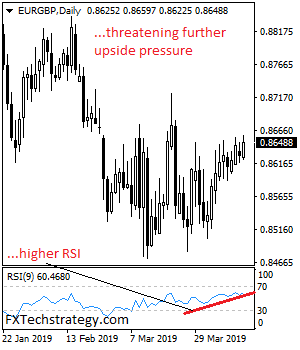 Further up, resistance comes in at 0.8750 level followed by the 0.8800 level. Its daily RSI is bullish and pointing higher suggesting further strength. All in all, EURGBP pressure still remains higher on further bull pressure. Risk Warning Notice Foreign Exchange and CFD trading are high risk and not suitable for everyone. You should carefully consider your investment objectives, level of experience and risk appetite before making a decision to trade with us. Most importantly, do not invest money you cannot afford to lose. There is considerable exposure to risk in any off-exchange transaction, including, but not limited to, leverage, creditworthiness, limited regulatory protection and market volatility that may substantially affect the price, or liquidity of the markets that you are trading. Margin and leverage To open a leveraged CFD or forex trade you will need to deposit money with us as margin. Margin is typically a relatively small proportion of the overall contract value. For example a contract trading on leverage of 100:1 will require margin of just 1% of the contract value. This means that a small price movement in the underlying will result in large movement in the value of your trade – this can work in your favour, or result in substantial losses. Your may lose your initial deposit and be required to deposit additional margin in order to maintain your position. If you fail to meet any margin requirement your position will be liquidated and you will be responsible for any resulting losses.